Risk Still Dominates Forex. The Dollar as “Safe Haven” is Back! Well over two years have passed since the collapse of Lehman Brothers and the accompanying climax of the credit crisis. Most economies have emerged from recession, stocks have recovered, credit markets are strong, and commodities prices are well on their way to new record highs. And yet, even the most cursory scanning of headlines reveals that all is not well in forex markets. Hardly a week goes by without a report of “risk averse” investors flocking to “safe haven” currencies. 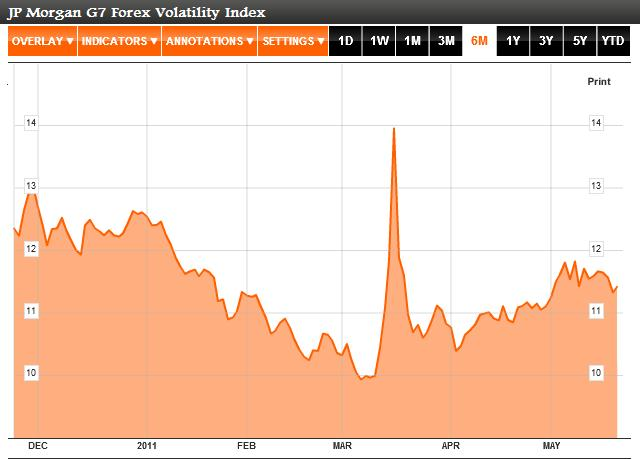 As you can see from the chart below, forex volatility has risen steadily since the Japanese earthquake/tsunami in March. Ignoring the spike of the day (clearly visible in the chart), volatility is nearing a 2011 high.What’s driving this trend? Bank of America Merrill Lynch calls it the “known unknown.” In a word: uncertainty. Fiscal pressures are mounting across the G7. The Eurozone’s woes are certainly the most pressing, but that doesn’t mean the debt situation in the US, UK, and Japan are any less serious. There is also general economic uncertainty, over whether economic recovery can be sustained, or whether it will flag in the absence of government or monetary stimulus. Speaking of which, investors are struggling to get a grip on how the end of quantitative easing will impact exchange rates, and when and to what extent central banks will have to raise interest rates. Commodity prices and too much cash in the system are driving price inflation, and it’s unclear how long the Fed, ECB, etc. will continue to play chicken with monetary policy. Every time doubt is cast into the system – whether from a natural disaster, monetary press release, surprise economic indicator, ratings downgrade – investors have been quick to flock back into so-called safe haven currencies, showing that appearances aside, they are still relatively on edge. Even the flipside of this phenomenon – risk appetite – is really just another manifestation of risk aversion. In other words, if traders weren’t still so nervous about the prospect of another crisis, they would have no reasons to constantly tweak their risk exposure and reevaluate their appetite for risk. Over the last few weeks, the US dollar has been reborn as a preeminent safe haven currency, having previously surrendered that role to the Swiss Franc and Japanese Yen. Both of these currencies have already touched record highs against the dollar in 2011. For all of the concern over quantitative easing and runaway inflation and low interest rates and surging national debt and economic stagnation and high unemployment (and the list certainly goes on…), the dollar is still the go-to currency in times of serious risk aversion. Its capital markets are still the deepest and broadest, and the indestructible Treasury security is still the world’s most secure and liquid investment asset. When the Fed ceases its purchases of Treasuries (in June), US long-term rates should rise, further entrenching the dollar’s safe haven status. In fact, the size of US capital markets is a double-edge sword; since the US is able to absorb many times as much risk-averse capital as Japan (and especially Switzerland, sudden jumps in the dollar due to risk aversion will always be understated compared to the franc and yen. On the other side of this equation stands virtually every other currency: commodity currencies, emerging market currencies, and the British pound and euro. When safe haven currencies go up (because of risk aversion), other currencies will typically fall, though some currencies will certainly be impacted more than others. The highest-yielding currencies, for example, are typically bought on that basis, and not necessarily for fundamental reasons. (The Australian Dollar and Brazilian Real are somewhere in between, featuring good fundamentals and high short-term interest rates). As volatility is the sworn enemy of the carry trade, these currencies are usually the first to fall when the markets are gripped by a bout of risk aversion. Of course, it’s nearly impossible to anticipate ebbs and flows in risk appetite. Still, just being aware how these fluctuations will manifest themselves in forex markets means that you will be a step ahead when they take place. lol, back for how long? one week? one month? until QEII is over, nothing will change. 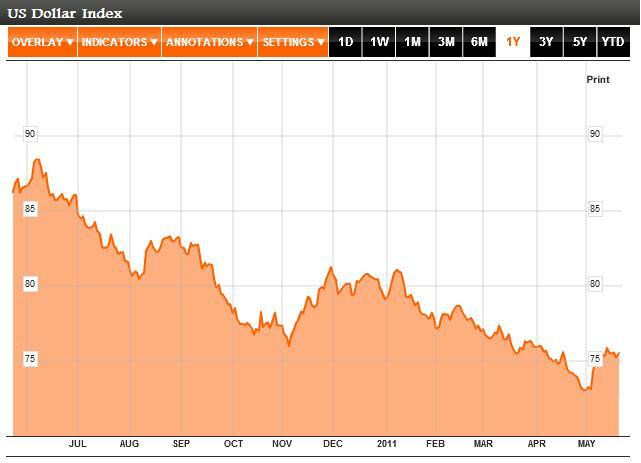 « Japanese Yen Strength is Illogical, but Does it Matter?